The benefits of air polishing for the dental professional include less operator fatigue, less time involved than the traditional polishing technique, and improved access to difficult-to-reach areas. Benefits to the patient include less time in the portable dental chair, less “scraping,” excellent stain removal, reduced dentin hypersensitivity, and improved periodontal status. While dental hygienists have a wide variety of experiences with and opinions about dental air polisher-everything from loving it to hating it. Patients likely have similar opinions depending on the type of device used, the powders used, and the expertise of the clinician providing the air polishing. New advancements in this technology have some pleasant benefits for you and your patients. In fact, a study published in 2014 by the Journal of Periodontology concluded, “For exposed root surfaces, sodium bicarbonate cannot be recommended.” It revealed that even five-second exposure with air polishing devices using sodium bicarbonate powder showed considerable surface defects. With the advent of air polishing devices designed for use with low-abrasive powders, dentists and dental hygienists can obliterate supra- and subgingival biofilm from enamel, exposed root surfaces, and restorative materials efficiently and comfortably. Air polishing devices with sodium bicarbonate powders are effective stain and biofilm removal on enamel, and highly effective for biofilm removal in pits and fissures prior to sealant placement. But caution must be taken to avoid exposed root surfaces and most restorative materials, which limits their use on periodontal maintenance patients. Which air polishing devices are currently designed for low-abrasive powders? The technology is rapidly changing in this area, but two companies that have air polishing devices with substantial versatility are Hu-Friedy/EMS and Acteon. The Hu-Friedy/EMS Handy 3.0 Premium Package is new to the market this year. It includes the PERIO-FLOW handpiece with disposable subgingival tips that are flexible to adapt to deep periodontal pockets, and the PLUS handpiece, which removes biofilm supragingivally and up to 4 mm subgingivally. The Handy 3.0 Premium Package is a portable device that connects directly to the dental unit and uses low-abrasive powders such as glycine or erythritol and has two interchangeable dental handpieces. Another innovative device in subgingival air polishing is Acteon’s Air-N-Go Easy. 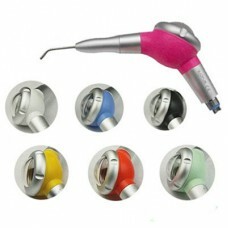 This is a portable device that connects directly into the dental unit and has four different nozzles for different clinical needs. It has the versatility of sodium bicarbonate or calcium carbonate supragingival powders and glycine powder for supra- and subgingival use. The four nozzles are the Supra nozzle using sodium bicarbonate or calcium carbonate powder for supragingival use, the Perio-Easy nozzle using glycine powder for subgingival biofilm removal in shallow pockets, the Perio-Maintenance nozzle using glycine powder supragingivally, and the Perio nozzle using glycine powder for deeper periodontal pockets.